When binding anything larger than 9 x 9 inches, I use a French double fold technique, cutting 2 inch wide strips on the crosswise grain. These strips are joined with diagonal seams and are folded in half before applying. Yes, I said I start with 2 inch strips for a 1/4-inch finished binding. I like my binding to be full all the way to the fold and the same width on front and back. However, it is impossible (for me) to do the final join on anything not having at least 9 inches on at least one side. 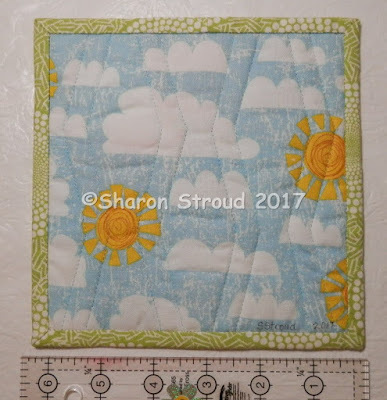 (Yes, I know this probably leaves you with many questions, but this is not a binding tutorial!) I found an alternative for the smaller pieces. 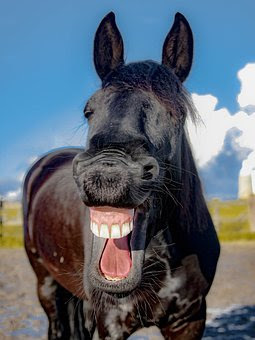 And I love it! Recently I have found a number of excellent blogs and have added them to my Blog List on the right side of what you are reading now. 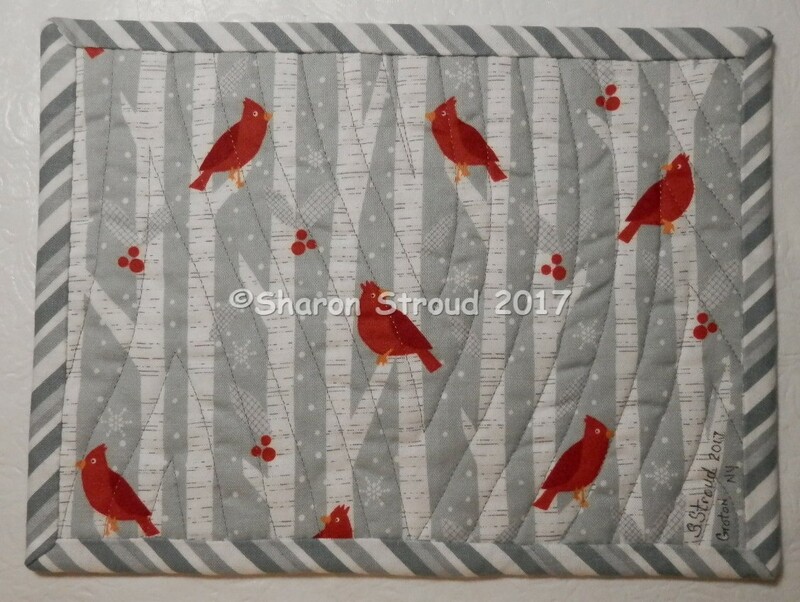 The Constant Quilter (Wendy Caton Reed) has a fantastic blog, and once I found her, I went back and read all her posts from the beginning. Wendy uses what she calls "the potholder method" where she makes and quilts one block and then binds it. She does that for each block in her quilt and then whipstitches all the "potholders" together into a bigger quilt. Can you believe she actually made a "Dear Jane" with this method? Well, she did! So, if you click the link above, it will take you to her post on Single Fold Binding. Because the Dear Jane blocks are less than 5 inches finished, I thought I'd give it a try. 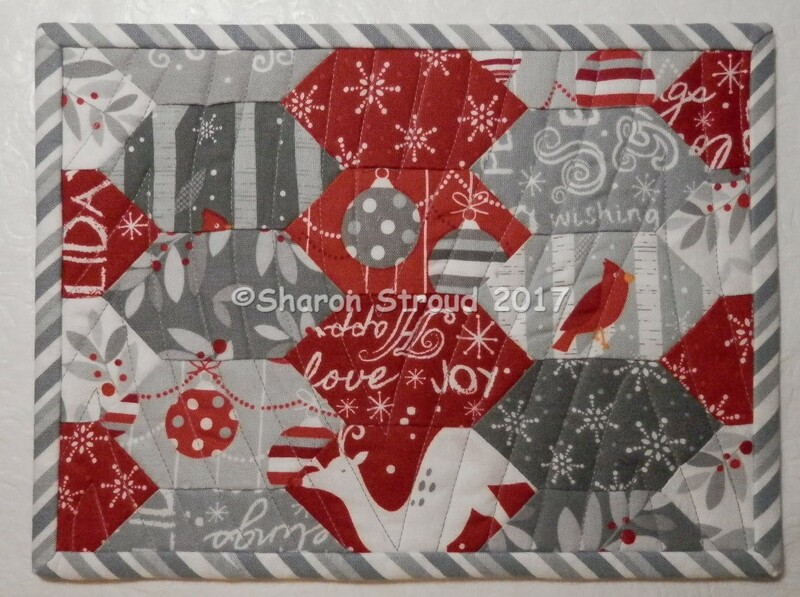 I had hand pieced several smaller tops while taking pics for new handouts. Here's the first one I did, using the process that Wendy has on her post. Here's the back, along with a ruler to show how big (little) this piece was. 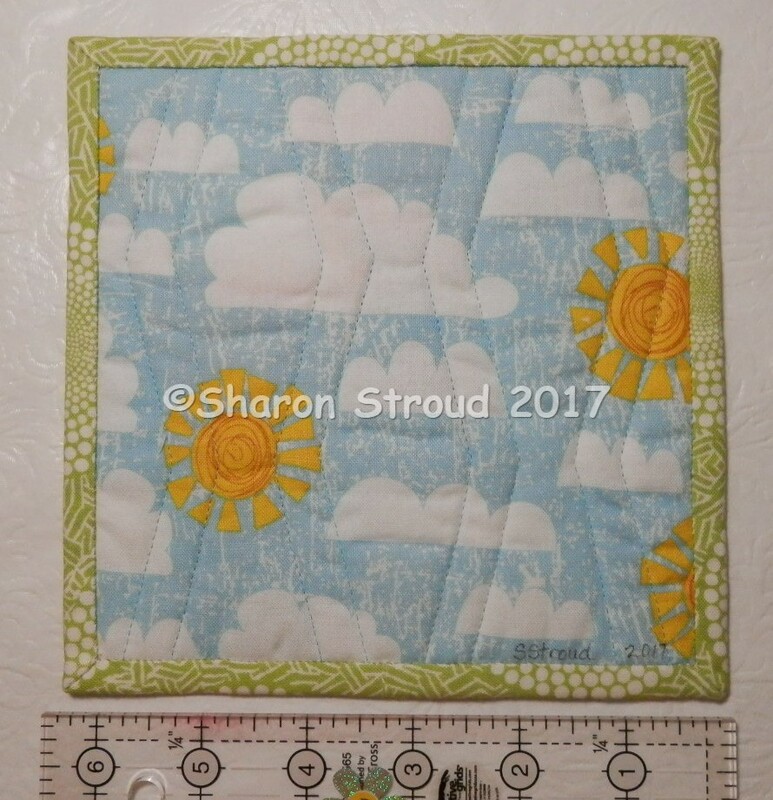 I admit that I was a bit unhappy with sewing a couple threads to the left of the fold lines, so I tried again; this time I sewed right on the fold lines (see Wendy's blog for her process). I was much happier this time. Try both ways and see which you like better; I may have sewed a bit left-er than Wendy suggested (read this as "it's always Sharon's fault, not the originator of whatever the technique is"). I love French double fold binding on almost everything. 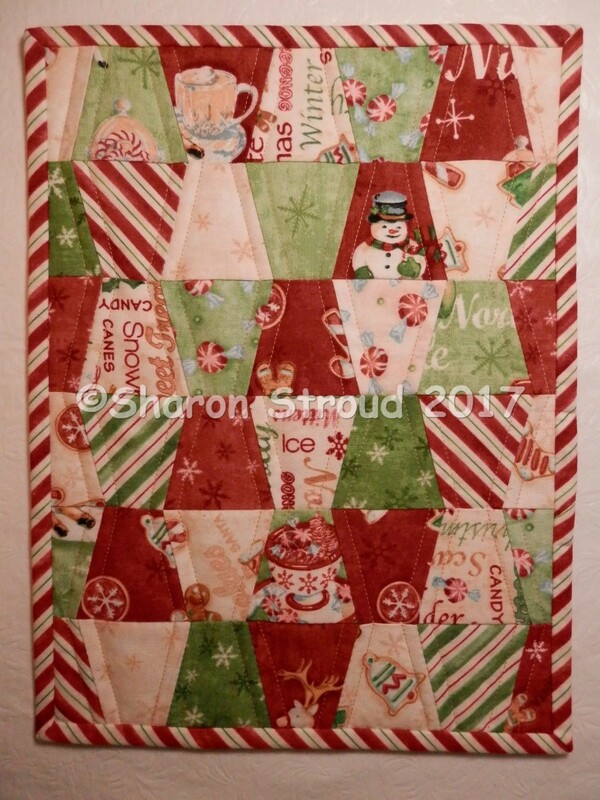 But this single layer binding has much less bulk and is super easy to apply and finish on smaller pieces. 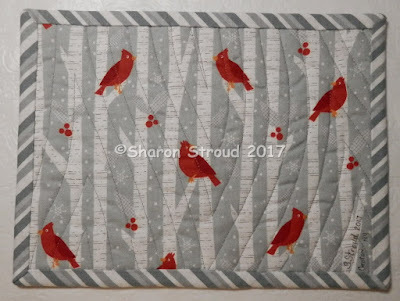 The potholder method of finishing quilts is not new--do a search for the term--or read more of Wendy's posts to learn more. Another great technique to put in your tool box! I also got a short movie, but I have not been able to upload it successfully. I really do love where I live. These two successfully fledged, and the parents have stopped hollering at me every time I move! I don't miss that! The phoebes are nesting again! So they are hollering at me on the side porch. Next up? 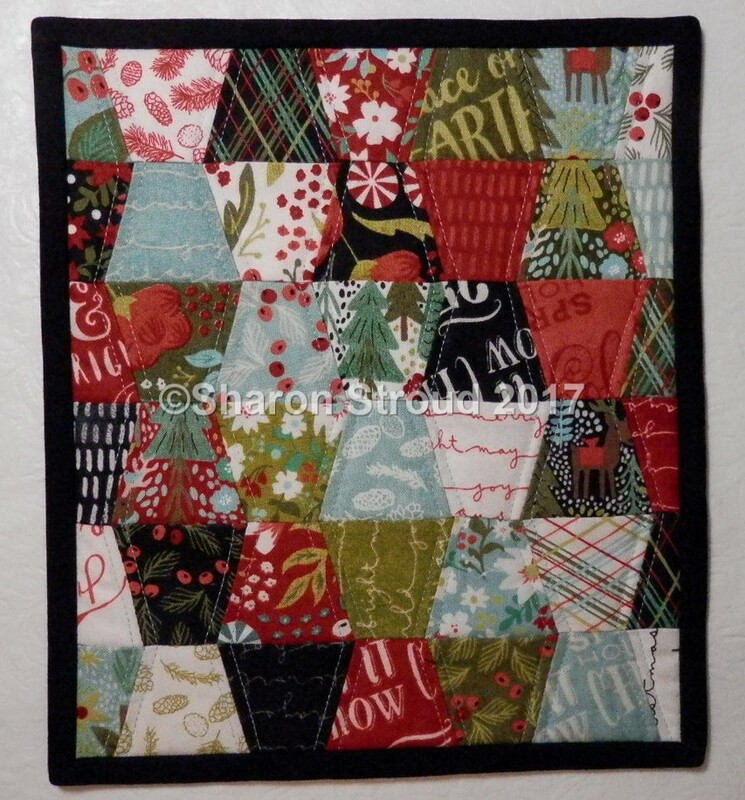 Yes, it's something quilty again! The back. 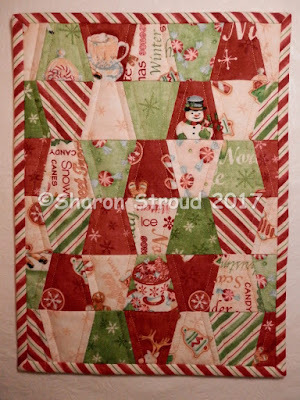 A bit more "Christmas-y" than the front (Jingle by Kate Spain). Because I had cut the front so that the directional fabrics all faced the same way, I needed to make some kind of hanging method, but I also needed something that would lie flat if I decided to use it on a table. Check this out! While checking out a new-to-me blog, I took a look at the tutorials of Laurraine Yuyama. 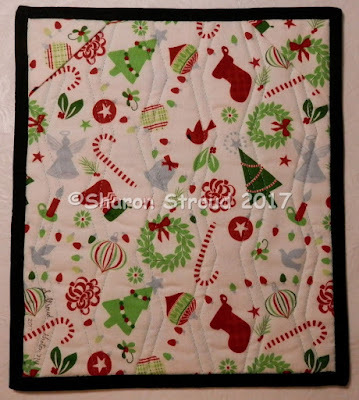 The directions for adding these quick, easy, and flat hangers are linked here (just click on her name to go directly to the directions). 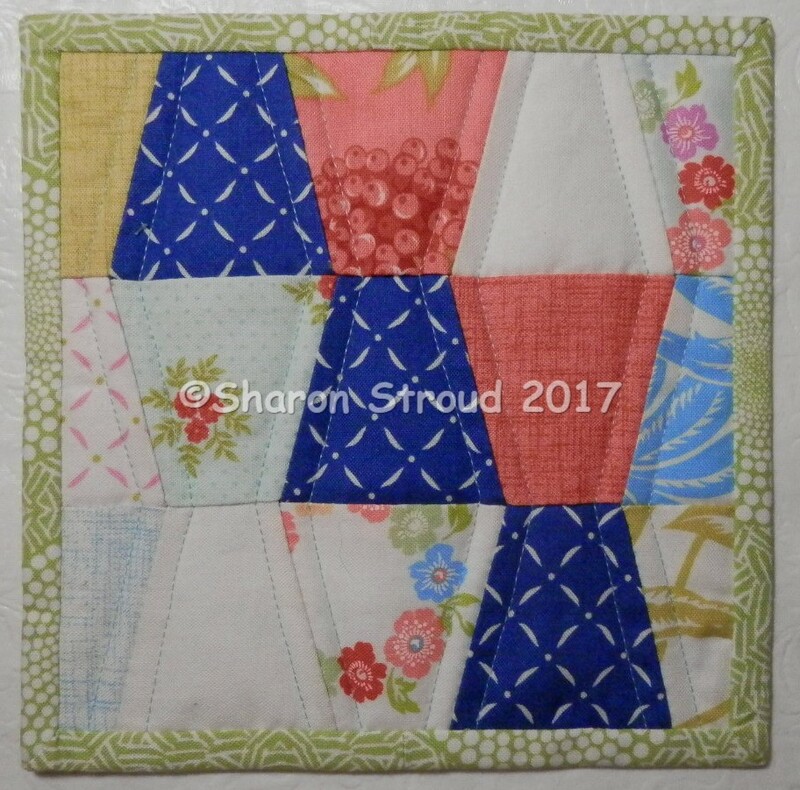 The only things I did differently are that I didn't topstitch the folds, and I only added the triangles to the top edge. 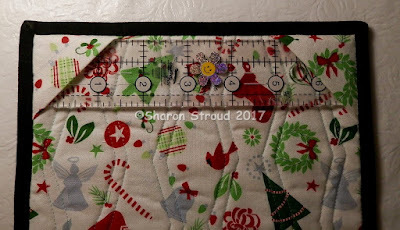 I stuck my ruler in so that you can see where a dowel can be inserted as a hanger! Works great on smaller pieces, but I wouldn't do this on something too wide (not enough support in the middle). In the second photo above, you can just barely see the corner triangles when they are not filled with the dowel. Perfect finish for those of us who can't make up our mind on hanging or not hanging a piece! While you are Laurraine's site also check this out: https://patchworkpottery.blogspot.com/2016/09/hollyhocks.html. 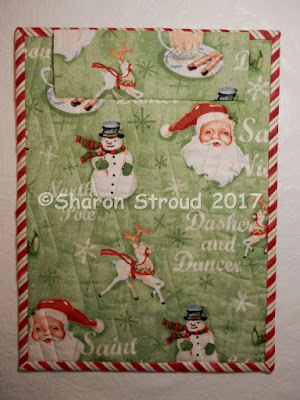 This was my introduction to Laurraine's blog and I still love it! Okay, that's it for today. It's been hot and humid with even more of both forecast for tomorrow. Stay cool (in the temperature sense; you are already too cool for words in real life!). Two-inch tall thimbles/tumblers with a wintry feel--and another striped binding. 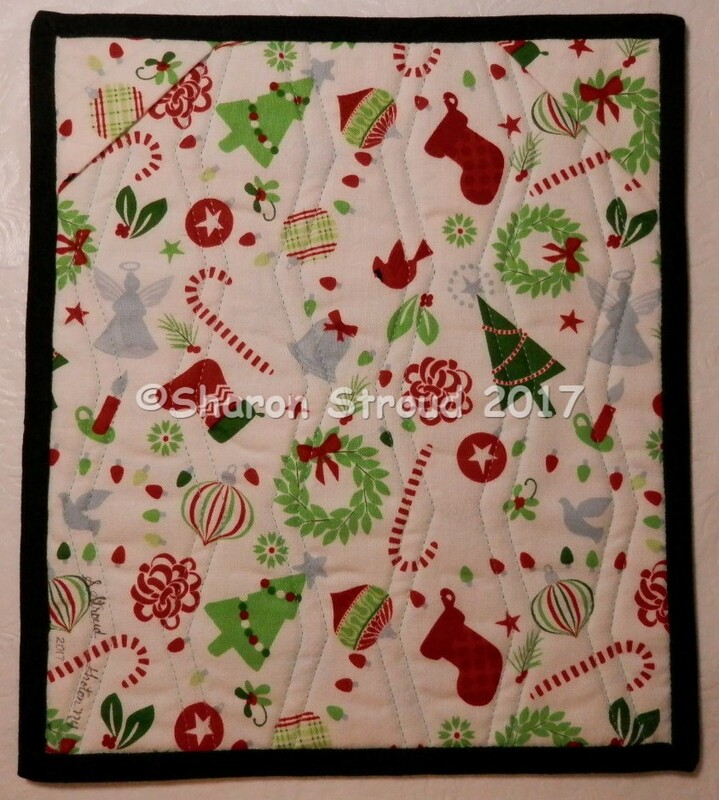 Hand pieced and machine quilted. Here are those fabulous Phoebes! About two days before they fledged. Four in that tiny nest, right outside my side door! Thanks for reading! More finishes on the way! 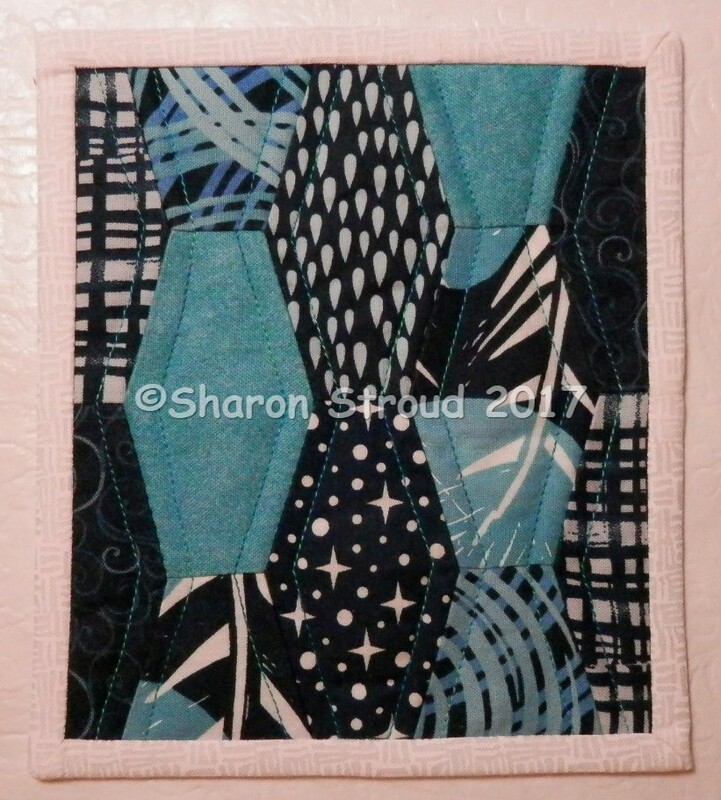 This top is hand pieced (elongated hexagons turned on their sides) and machine quilted. I especially love how the stripe works for the binding--all straight cut, no bias! 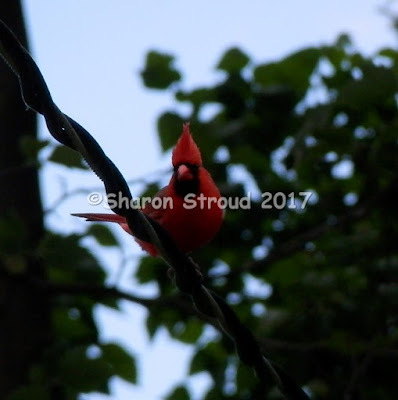 And, in keeping with the theme (Cardinals), here's a proud male sitting on my power line. 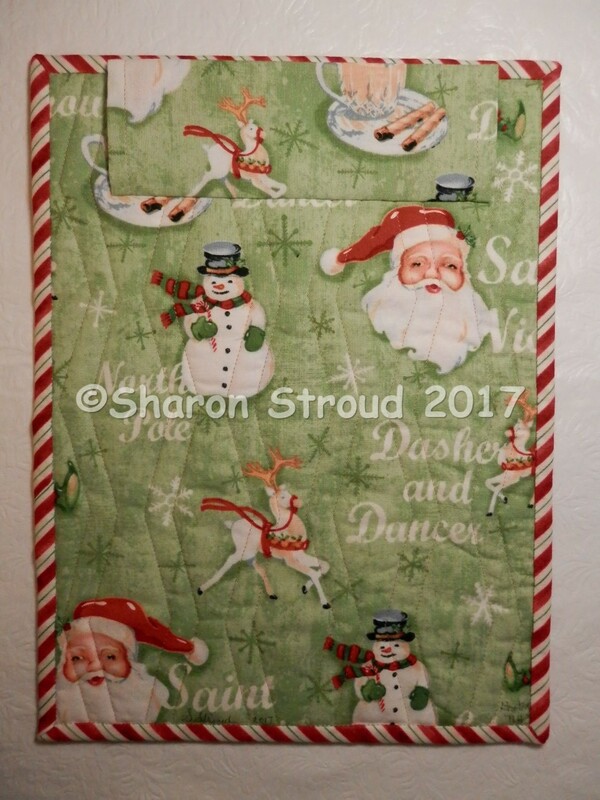 Be sure to take a look at this post by Dutch Comfort (here) for a visual feast of what she's been working on. For those of you who love the Australian designers, it's a real treat. There are several finishes in the wings awaiting their turn to star on the blog. They are impatient, so stay tuned!